With the Democratic National Convention having wrapped up last night, Freewheelin has opened the minds of many Americans about what bike-sharing is and what it could be for their home city. According to MarketWatch, "riders took 5,552 Freewheelin rides this week, logging 26,493 miles ridden in and around downtown Denver. That equals 821,304 calories burned and a carbon-footprint reduction of 9.3 metric tones. The rides/miles goal for the DNC and RNC combined is 10,000 rides and 25,000 miles; riders in Denver have already eclipsed the miles goal." OK, Republican conventioneers, now it's your turn to show which party is the king of bike-sharing. Freewheelin's next stop is Minneapolis and St. Paul this Saturday, August 30. At 10 a.m., leaders of the Republican National Convention host cities will lead an inaugural Freewheelin ride through Minneapolis. The Freewheelin' stands will be open September 1 - 4 from 7am - 7pm at seven locations in Minneapolis and St. Paul. According to an article in Canada's Globe and Mail, Toronto Councillor Adrian Heaps "expects to announce the rent-a-bike program by the end of October" with a Summer 2009 launch. The term "rent-a-bike" is the article author's terminology. Calling bike-sharing "rent-a-bike" is like calling a fine California wine "grape juice". Rent-a-bike is what bike shops do. Bike-sharing is what cities and universities do. One is recreation, the other is transit. The article continues, " '[The bike-sharing service] should be privately run. I'm of firm belief [the city] should have no role in running it, though we certainly should be setting the standards,' Mr. Heaps said. "But lack of funding has blocked at least one similar endeavour. Toronto's Community Bicycle Network bike-share program sank in 2006 after they it find the funds, said mechanic co-ordinator Sherri Byer. "The network charged membership fees of about $35 and relied on grants, she said, but it wasn't enough. Still, the market is there." The Community Bicycle Network ran Toronto Bikeshare, a great 2nd generation program operated by highly dedicated individuals. 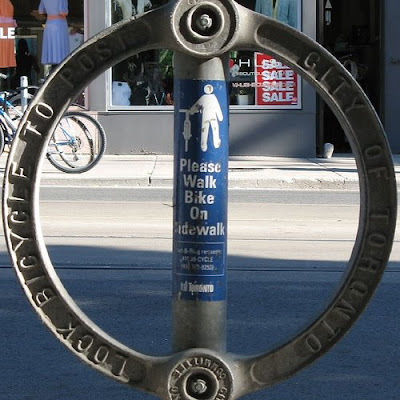 Registered customers could access bikes by speaking with the shop owner, University of Toronto staff member, or other individual who had a key to unlock the bikes from a rack just outside of the respective organization's building. These were yellow utilitarian bikes and wheelbender racks. It wasn't high tech to be sure, but for a low budget program it was a good economical idea that worked for many years. When I visited Toronto Bikeshare a few years ago I was impressed with Toronto's bike infrastructure and bike mode split. I'm sure bike-sharing will do well there. I imagine the tender for an operating would be out next month. Stay tuned Torontonians. If you thought 20,600 Velib' in Paris was a lot, well try on 28,100 for size. 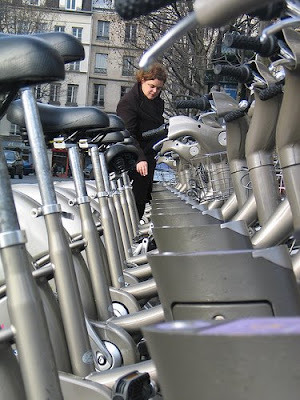 According to Conde Nast Traveler, Velib' will be expanding by the end of the year by 7,500 new bikes and 300 stations to Paris' inner suburbs. For those keeping track, Velib' will be expanding by a quantity of bikes that, if as its own separate program, would be the second largest program in the world. It looks like it's smooth riding for even more Parisians. The good folks from Streetfilms recently came to D.C. to check-out our new SmartBike DC program and I joined them. This was our maiden voyage on the bikes and enthusiasticly I give the system the grade of an A-. The bikes were comfortable, clean, tires had good air pressure, the bike handled turns well, and the gears worked smoothly. The only problem was the station's computer was having a short-lived technical issue which fixed itself. I understand that 350 memberships have been sold so far and that a limit of memberships may have to be put in place until more bikes and stations can be put out. If a limit were put into place, I hope D.C. residents are prioritized in who may receive their smartcards as their public space is paying for the program. This wouldn't be a first. Barcelona also limited membership to residents when they first started. The following is a press release from Humana about its upcoming launch of Freewheelin' at the Democratic National Convention in a few days. The stations with a total of 1,000 bikes will be attended by volunteers during the Convention and 70 bikes will remain afterwards at the automated stations. Who Obama chooses as his Vice Presidential candidate is important, but moreso, will Obama ride? We'll see. WHAT: A 100-cyclist ride event with Mayor John Hickenlooper through the streets of Denver to kick off Freewheelin, the nation’s largest bike-sharing program to date, debuting at the Democratic National Convention. Legislators, convention attendees and city residents are invited to kick up their kickstands and be one of the first to experience bike-sharing, the international social movement whereby bikes are situated at designated stations throughout cities for individuals to use for a specified amount of time. The three-mile ride will end at Sculpture Park where brunch will be served. MORE: Through a unique partnership between Humana and Bikes Belong, the Freewheelin bike-sharing experience will be in Denver for the duration of the convention (Aug. 25–Aug. 28). The city will be outfitted with 1,000 bikes for free use during the convention week. Bikes can be accessed via the various bike stations that will be set up throughout the city. Riders will also be able to track miles ridden, personal carbon reduction and calories burned. For more information or to register to be a part of the Freewheelin effort, please visit: www.freewheelinwaytogo.com. I recently returned from visiting the good folks at Stationnement de Montréal in Quebec, Canada. 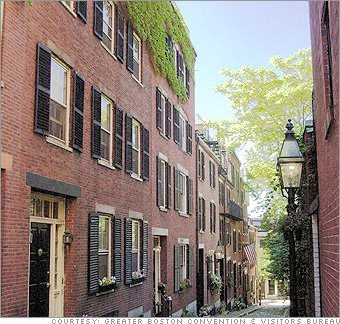 They are the city's public-private partnership agency that is tasked with ensuring "the optimal management of paid on-street and off-street public parking to promote the development of economic activity." They are the city's parking agency, plain and simple. Not happy with the advertising model of bike-sharing which has become the norm, they stepped up to the task of developing their own bike-sharing technology with their own funds - $15M of them. Unlike other kiosk systems, Montreal's system is designed with a platform which will be uninstalled for the cold season, considering that January averages 12 degrees Fahrenheit (-11 degrees Celcius). Call me a whimp, but that's well below my line where I'm not riding. Rather than the expense of hooking each station up with power, Montreal's system will be powered by the sun - two small solar panels will electrify each station. Key fobs will be used in place of smartcards to make rummaging around in one's wallet or purse easier as the fob simply can be added to one's keychain. The bikes are step-thru models specially designed for the program and appear streamlined and durable. As Stationnement de Montreal says on the Website, their bike-sharing system "was inspired by other systems already in place in cities around the world, taking the best elements from each and avoiding errors that have been made along the way." As I've blogged about before, they are allowing the public to come up with the program's name through their "Find my name!" Website. This is a good way to create buzz about the soon-to-launch program, generate civic pride, and it sure beats paying an ad agency thousands of dollars to do the same thing. Voting ends in three weeks and the grand prize is a lifetime membership with the program. I'm keeping my fingers crossed. Montreal is planning to have a soft launch in September with 40 bikes at four stations before closing the program for their harsh winter. 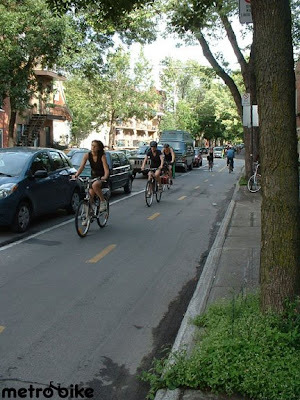 During their cold season when only the truly die-hard are biking, Stationnement de Montreal will tweak the system and get it ready for the big launch in Spring 2009 with 2,400 bikes at 300 stations. This will surely make it the largest bike-sharing program in North America at that time. Much research and design has gone into this system and I believe it will do very well. 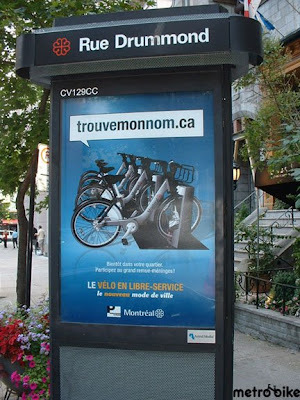 Bike-sharing will do well in Montreal as it's a great city for biking, likely one of the best in North America. Rather than the uni-directional cycle tracks, or physically separated bike lanes, that are more common in bike-friendly cities and towns, Montreal has bi-directional cycle tracks. It's a wider track made for two-way bike traffic. The cycle tracks downtown have a concrete divider separating them from motor vehicle traffic and the residential neighborhoods have a parking lane separating cyclists from motor vehicle traffic. The physical separation makes all the difference in encouraging cycling. It's more than a coincidence that most of the bike-friendly jurisdictions are those which have cycle tracks. It’s official! 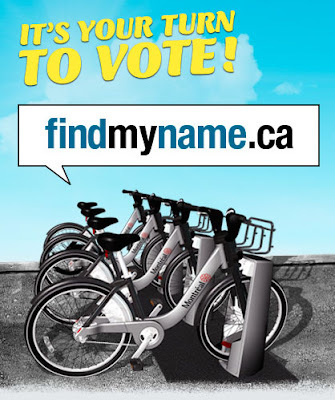 North America’s first high-tech bike-sharing program has launched! SmartBike DC opened for business today with 60 of its 120 bikes and 10 stations becoming available to the public. According to The Washington Post, Jim Sebastian, DC’s Bicycle Program Manager has said that the service will only be available to registered customers. The launch should provide the D.C. government and the program’s operator, Clear Channel Outdoor, sufficient time to expand and adjust the program for a larger program next year. Today marks the beginning of a new era for bicycling in the United States. Due to fuel prices and the resultant affects such as the beginning of a contraction of exurbs (or distant suburbs) and shifts away from single occupant vehicle travel to transit and biking, a colleague has said that the U.S. is beginning to renegotiate the social contract we have with public space. For a video on the bikes, local TV station NBC4 has this. It's going to be a busy fall, bike-share fans! Posted by Paul DeMaio at 5:37 PM No comments: Labels: Clear Channel Outdoor, SmartBike DC, Washington D.C.
Pre-registration for the bike-sharing programs at the Democratic National Convention in Denver and the Republican National Convention in St. Paul-Minneapolis is available at http://www.freewheelinwaytogo.com. For those who plan to be in these cities during the conventions, this is the first step of a streamlined process to introduce people to shared bike systems that are to be showcased to policy makers, guests, and citizens. Pre-registration is quick and easy and makes completion of the registration process at each event simple. Use of the systems will be free with a photo ID, and a valid credit card is required for collateral. 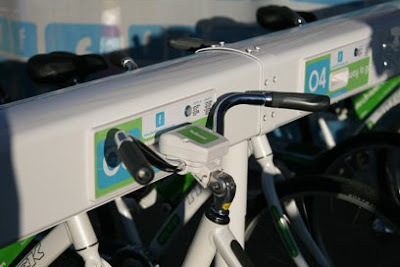 The temporary bike-sharing systems in both cities have been facilitated by generous contributions and support from Bikes Belong, Humana, numerous bicycle manufacturers, as well as dedicated city governments, advocacy organizations, and citizens of each locale. 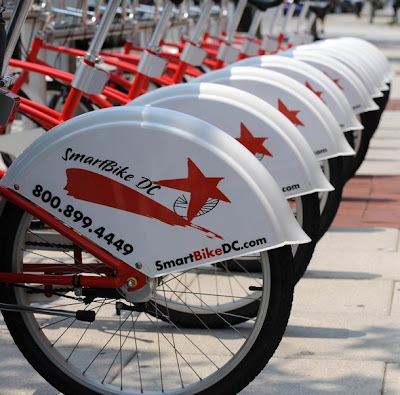 According to DCist, SmartBike DC has begun beta testing to ensure the technology is operating correctly. Folks may apply for their smartcard now at the program Website. The launch is near! Boston has released a Request for Information to learn more about bike-sharing technologies and models for implementation. They're estimating the first phase of the project to include 450 bikes, 1,000 for the second phase, and "over 1,500" for the third. - Facilitate transit for commuters, tourists, and other visitors. - Provide a service that results in high rates of membership satisfaction." It's great to see Boston interested in bike-sharing. They've recently hired the city's first bicycle coordinator and have a lot to do to make Boston into a truly bike-friendly city. However, with the Request for Information, they are well on their way. The City of San Francisco is working towards its own bike-sharing program, however, due to a legal challenge preventing any bicycle-related development, San Francisco hasn't been able to make much progress towards bike transit... until now. According to an article in The Examiner, San Francisco Mayor Gavin Newsom "said he’s found a way to start a smaller [bike-sharing] program without violating the court-ordered bike plan injunction: offer an internal network only for the City’s 28,000 or so employees." " 'The [San Francisco Municipal Transportation Agency] is developing details in the next few months and will implement the program for city employees soon,' said the Agency's director Nathaniel Ford. 'We are in discussions with Clear Channel about the bike-share component,' Ford said. 'When the bike injunction is lifted, we will implement it citywide.' 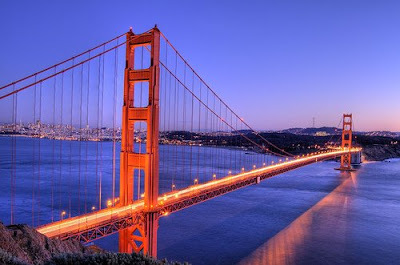 "
The lawsuit stems from the Coalition for Adequate Review which sued San Francisco last year, "claiming that the bicycle plan should be subject to environmental review because it makes physical changes to the City’s streetscape," writes The Examiner. "The group cited the California Environmental Quality Act, which requires public projects to undergo a review if they might alter the environment. In order to come into compliance with CEQA, the City must either conduct an environmental impact review or become exempt from the process." Thanks to a heads up by WashCycle for this article.